Getting the most out of your EZ Ebook Template collection doesn't have to be a mind scramble. You can do it. 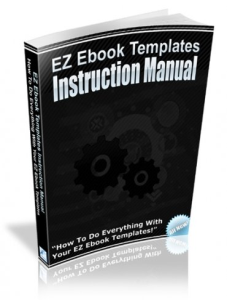 How To Do Everything With Your EZ Ebook Templates is a handy 130+ page PDF instruction manual that walks you through every process of editing any ebook template found inside any EZ Ebook Template package! Whether it's an existing ebook template, or a future ebook template not even thought out yet, this step-by-step guide will tell you exactly what you need to know to become an EZ ebook template pro almost instantly. This guide has helped hundreds of people, just like you, that don't know the difference between a Header and a hole in the ground generate their own unique PDF ebooks from an EZ Ebook Template quickly. You can learn everything you need to know about editing and using any EZ ebook template. From opening up your very first EZ eBook Template, to making graphic adjustments, to creating a PDF file... It's all there ready to improve your learning curve and demystify EZ eBook Templates once and for all.